Shopping Center Metal stud framing, fire taping jobs in strip centers / malls. Walls installed, moved or removed. 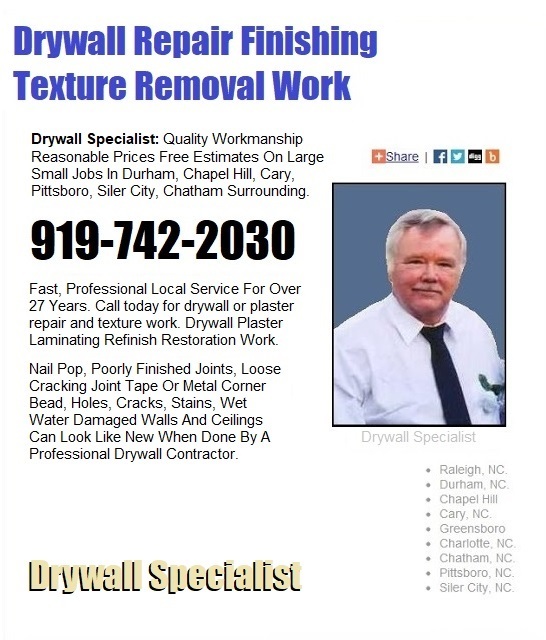 Call Drywall Specialist A skilled highly trained renovation expert for drywall framing, installation, finishing and fire taping work in Durham, Chapel Hill, Cary, Pittsboro, Siler City, Chatham and surrounding. Professional Shopping Center Renovation Work Including Framing, drywall installation, finishing, fire taping service and renovation work in strip centers and strip malls. Competitive prices and free estimates in Central North Carolina. Pittsboro Drywall Copyright 2018 All Rights Reserved 919-742-2030 Shopping Center Renovation Metal Framing Fire Taping Jobs, Durham, Chapel Hill, Cary, Pittsboro, Chatham County, NC.